When I started my career coach blog back in 2009, the very first thing I did to monetize was research and find affiliate programs in my niche. No barrier to entry: You can literally sign up today and start promoting offers. No hidden costs: There’s zero cost to sign up. No risk: There’s no huge investment of time. No fulfillment: No customer support service needed. Monetize now: You can start promoting today. Serve your audience: You become a “resource” to your audience. Learn what your audience wants to buy: You can create your own products and services once you know what they want help with! Learn how to sell: Selling is part of operating a business and a skill you can develop. Income is mostly passive: You can earn affiliate income today from a blog post you wrote several months ago. When other people click on your link and then make a purchase, you will get credit. You will receive your commission check either by Paypal, checking account deposit, or a check in the mail. This is the most common type of affiliate program, and it’s been around since the dawn of the internet. You can find one-time affiliate commission programs all over the internet, including places like Amazon, Walmart, etc. What if you could make one sale and receive an on-going commission each and every month? The recurring affiliate program is by far my favorite one. You will mostly find these programs on products that have a monthly subscription. For example, I use and promote ConvertKit as my favorite email list building service. Also, you don’t have to have a huge audience or mailing list in order to qualify to promote these programs. If this method interests you, I’d encourage to sign up to Matt McWilliams’ Affiliate Launch Notification List. You’ll hear about upcoming launches you can promote. I’d recommend that you apply for a Free EIN Number so that you’re not sharing your personal social security number all over the web. Check out our blog post on how to easily apply for your free EIN Number. ClickBank.com – ClickBank has also been around for a long time. Most of the products you’ll find here are digital in nature. They are usually either a software tool or an online course of some kind. Linkshare.com – Another solid program that has some great products and services you can promote no matter what niche you serve. 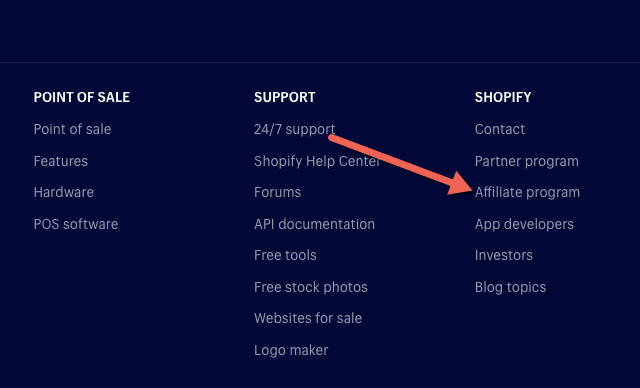 Below you’ll see an example from Shopify.com. Name – This can be helpful when you need to find your affiliate link fast. You can sort the column by alphabetical order saving you precious time. Affiliate Link – This should be the “pretty” link you’ve set up NOT the raw affiliate link you were given. Sometimes affiliate programs switch the affiliate software you use. If you’ve created your own link using a plugin like Pretty Link Plugin, you’ll be able to easily change the target URL without changing your link. Type – Some affiliate programs pay instantly, lifetime recurring, or a certain percentage. This is where you can easily recall the terms. Special Notes – You can place anything you’d like in this column that would be helpful to remember. Here’s an example of one I did for my review of Kajabi: The New Kajabi Review: Is It Really Worth It? PRO TIP: Be sure to use a free link shortener plugin like Pretty Link. 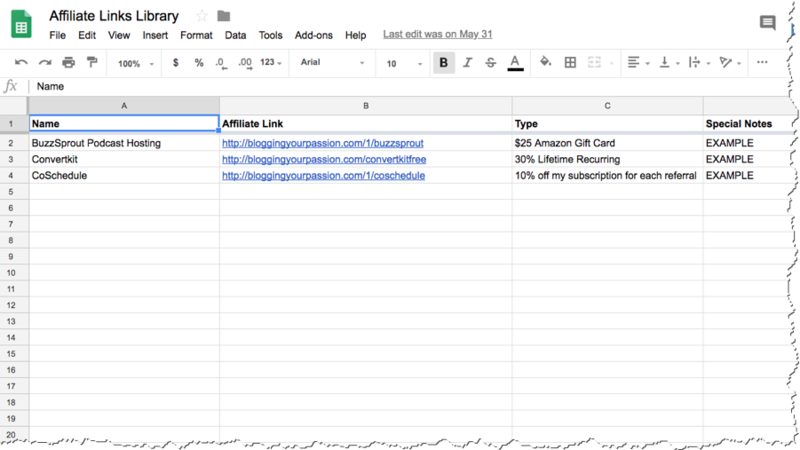 Not only will it make your links look better, but it will be easier to change the raw affiliate link if that product ever changes the affiliate program they use. Do you ever record videos for YouTube? If so, you should absolutely include affiliate links in the description area below your videos. I’ve done video tutorials showing how I use a software or tool and then mention my link that is displayed below the video. If you have a podcast, you can also share affiliate links on your podcast episodes. There are two effective ways to do this. If you love to teach, then you’ll love this strategy. Promote a free webinar on how you use a certain tool, product, or service. Spend 90% of the webinar on just showing how you use the tool. The other 10% of the webinar share your affiliate link as an easy way to get started. If you have a mobile phone and a Facebook account, then you can do this strategy. Go live on Facebook and share your own experience or review of the product, then share your affiliate link in the comments.